What it’s about: Hazel has already gotten her miracle. Two years ago, the doctors seems sure that her thyroid cancer would leave her with only a few months to live. But then she started taking an experimental drug and now her expiration date is more of a question mark. Everyone knows it’s coming, but since the drug is untested there’s no way to guess when it might be. Enter Augustus Waters, a new addition to Hazel’s weekly cancer support group. Augustus is on the other side of his battle with bone cancer, but has joined the group in support of his friend Issac, whose eye cancer is about to leave him blind. Hazel finds a kindred soul in Augustus, but knows what she is—a grenade, ready to burst and leave all those who love her wounded. She tries to keep Augustus at arm’s length, but their connection is too strong. Though Hazel has cancer, this should by no means be considered a “cancer book.” It is a love story, a story about struggle, and, most acutely, a story about how a young person deals with the reality of death. You may cry, but you’ll also laugh, you’ll think, you’ll smile, you’ll feel warm-fuzzies. It’s a deep, rich book that drives you to ponder mortality, family, love, literature and our heroes. 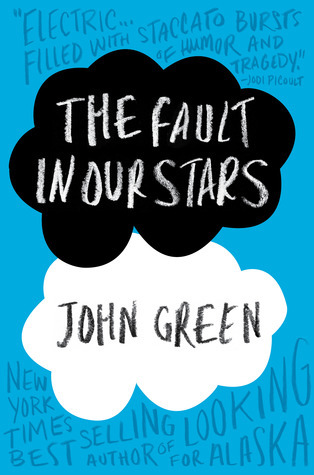 I’m almost through the Green oeuvre now, but TFIOS takes the lead as my favorite. Green’s back up to the emotional resonance he achieved in Looking for Alaska, but the female narrator does him a great service this time around. I saw repeated elements in Alaska and Paper Towns tied to the male voice, in particular the nerdy male narrator idealizing an unattainable female. The first time around it worked for me, but the second time I felt a bit of deja vu. Hazel’s voice retains the poignant honesty of his previous narrators, but feels singular and fresh. And though she’s also in love, this is a very different kind of love than I’ve seen Green tackle before (I haven’t yet read An Abundance of Katherines, so that book must be excluded from my analysis). Though Augustus and Hazel are teenagers, their life experiences age them emotionally and bring an element of the adult to their relationship. And that’s a good thing. Would I recommend? Most definitely. Green has found a great balance in this book and created a compelling story that goes far, far beyond the confines of what we’ve come to expect from a story about cancer. P.S. I did not receive a Hanklerfish or a Yeti and I’m very disappointed. i love all things john green (and really enjoyed abundance of katherines) and this one ties with will grayson as my favorite. the humorous moments knock you over and then the emotional scenes finish you off. i’ve never felt so bipolar as when i read this book.